Hi everyone! I know I haven't updated in a while, and I'm sorry about that. Things have been hell lately and getting back on track has been unbelievably hard. 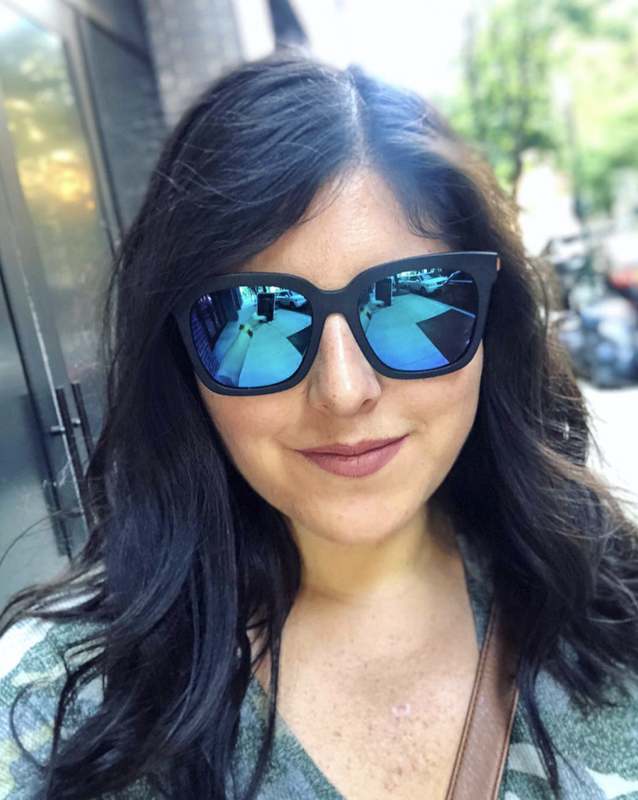 I've had many downfalls during this journey, but my recent personal failures have reached epic proportions (or so it feels). I could go on for days about bingeing and self-loathing, but that doesn't help myself nor anyone else. 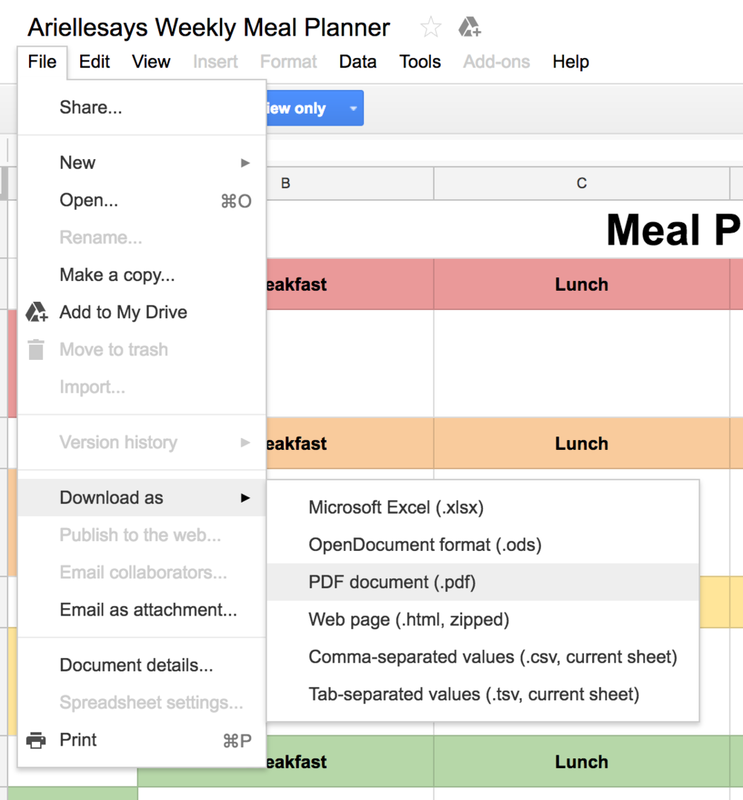 Instead, I am putting my energy into a meal planning calendar I made in Google Spreadsheets. So here's the thing: I fucked around in Google Spreadsheets for hours and this is what I came up with. I couldn't figure out how to make a custom template, so I just did the best I could to share it with everyone else. You will not be able to edit my doc and you will not be able to see my personal meal plan. I repeat, YOU WILL NOT BE ABLE TO EDIT MY DOC. You can either download it as a PDF and print it, or you can sign-in to your Google account and copy/add to your Google Drive. I'll show you how below. Export > Print > Done! IMPORTANT: If you download as PDF, you will only get ONE week (for example, 9/11 - 9/17). You have to click each date tab at the bottom of the spreadsheet and download each one as a PDF in order to get different weeks. Screen shots below. Rename your meal plan however you like and save to "My Drive" folder. 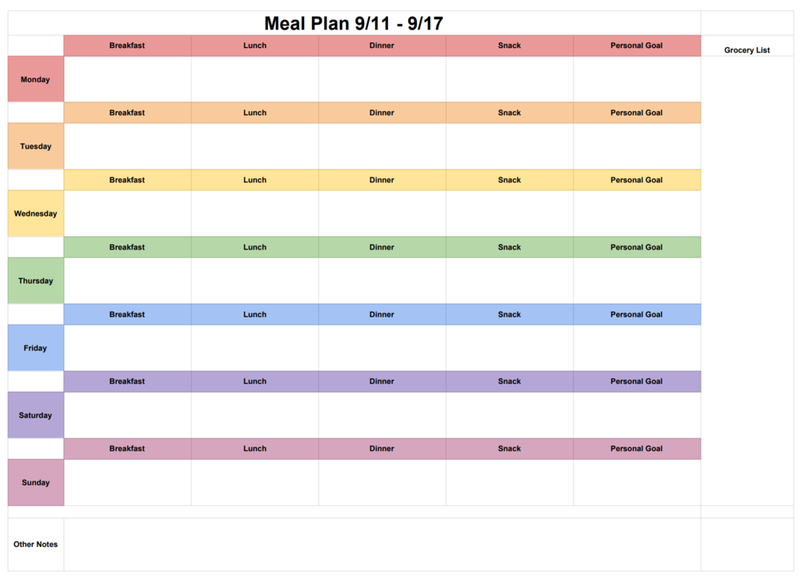 Start typing in your meal plan! Click on the bottom tab according to date to start each new week (filled out till the end of the year). Pro tip: If you are trying to type in your grocery list on the far right and want to make it more of a list (screen shot below), press Command and then Enter and it will go to the next line. I hope this is helpful! Now, I love you guys, but I do not work at Google and I am not helpdesk. If you have a question, please try searching for a solution on the internet or ask someone IRL! I'm learning too and I have a lot going on with work and my personal life that I find it overwhelming to answer so many questions. I'm sorry! 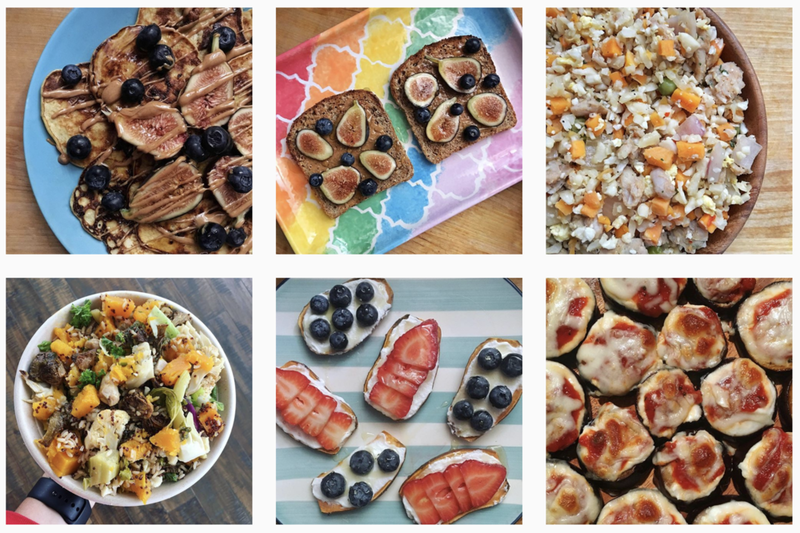 Also, I am not uploading my personal meal plans as of right now, but if I decide to, you will see it on the site!